Remi El-Ouazzane for Intel: Throughout my career, and now more than ever at Intel, I have dreamed about where technology will take us next, and it’s even more exciting to be creating the future. Today, that future is here with the unveiling of the Myriad™ X, the world’s first vision processing unit (VPU) to ship with a dedicated Neural Compute Engine to deliver artificial intelligence (AI) capabilities to the edge in an incredibly low-power, high-performance package. In the coming years, we’ll see a huge range of new products emerge that are made more autonomous by embedding real-time intelligence capabilities in devices – from drones and smart cameras to augmented reality and more – to give them the ability to see, understand, interact with and learn from rapidly changing environments. Myriad X combines dedicated imaging, computer vision processing and – thanks to the industry-first Neural Compute Engine – high-performance deep learning inference within the same chip, and the results are opening up new realms of possibility. With this faster, more pervasive intelligence embedded directly into devices, the potential to make our world safer, more productive and more personal is limitless. From autonomous delivery drones and security cameras with contextual understanding to personal robots that have both situational and emotional awareness, Myriad X will unleash innovation for a new future of intelligent and autonomous devices. To make this possible, we’ve removed the time and power constraints of communication with the cloud and enabled deep learning at the device level. This is where the power of the VPU comes in – the Movidius™ platform is specifically designed to meet the challenges of autonomous devices. 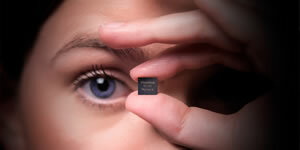 Our tiny VPUs put visual intelligence directly onboard the device while delivering industry-leading compute performance at an ultralow power threshold.